Objective: Ascorbic acid is the most abundant water-soluble naturally occurring organic compound with antioxidant properties. It serves as a cofactor for enzymes involved in hormone biosynthesis, and the regeneration of antioxidants. Plants and food rich in ascorbic acid have been widely used in Ayurveda to treat a variety of psychologically stress related disorders. Materials and Methods: The experimental protocol was designed to evaluate the oral efficacies of ascorbic acid for putative adaptogenic activity in male mice. A battery of behaviour test models viz. stress-induced hyperthermia, tail suspension test, and pentobarbital-induced hypnosis were used to evaluate the adaptogenic activity of ascorbic acid. Mice were divided in different groups, and were orally administered with daily doses of ascorbic acid (5, 25, 125 and 625 mg/kg) solution (10 ml/kg) prepared with pH balanced distilled water for 11 consecutive days. For assessing long term effects of treatments against stress triggered physiological response, changes in body weights and basal rectal temperatures were also quantified. Results: Stress-induced hyperthermia was significantly (p<0.05) reduced by ascorbic acid in dose dependent manner and also compensated the body weight and basal rectal temperature due to daily handling and intermittent foot shock induced stress. Daily treatments with the acid also reduced the immobility period in tail suspension test and had considerable potentiating effect on onset and duration of sleep in pentobarbital-induce hypnosis test in dose dependent manner. Conclusion: These observations suggest that ascorbic acid is potentially an adaptogenic agent, and that it could be used for prevention and cure of diverse spectrums of stress triggered psychopathologies. Ascorbic acid (vitamin C) is a water-soluble vitamin that participates in a wide range of physiological reactions. It is an exogenous antioxidant which promotes and maintains the body's defence mechanisms against oxidative stress and associated disorders [1,2]. For the synthesis of collagen, carnitine and catecholamines, it also acts as a cofactor to initiate hydroxylation reactions needed . The antioxidant properties of this vitamin are due to its electron donating and free radical scavenging action . Animal studies have revealed analgesic , anti-inflammatory , and antidepressants and anxiolytics like [6-12] efficacies of ascorbic acid, and that as an antioxidant it reduces growth rates of aggressive tumours without any apparent side effects [13,14]. Various in vitro and in vivo studies have also revealed its antioxidant activites , and suggest that due to its antioxidant properties it acts as a neuromodulator , and neuroprotective agent [3,17]. It also modulates noradrenergic and dopaminergic neurotransmission by facilitating nerve growth [18-25]. Clinical reports from various randomized trials shown that at high-doses, ascorbic acid could be able to reduced both internal and external physiologic stressors, and maintains homeostasis of body in stress associated conditions . These reports indicate that ascorbic acid is an essential vitamin which could modulate several therapy relevant biological functions. Stress responses are specific as well as non-specific. The stress producing factors are different and yet they all produce essentially the same biological stress. The body responds to increased psychological demands by releasing adrenocorticotropin (ACTH) from the anterior pituitary and consequently glucocorticoids from the adrenal cortex, epinephrine from adrenal medulla and norepinephrine from sympathetic nerves. The management of unusual stress has huge significance in day-to-day life. It is possible to support the body's adaptation by using food supplements, dietary elements, herbs and minerals for increasing physical and psycological performance. Supplementation with various macroand micro-nutrients and herbal preparations has been shown to possess adaptogenic activity during exposure to stressful environment. Such substances have been described as 'adaptogens' [27,28]. Although efforts from various disciplines around the world were made to evaluate the activity of ascorbic acid against various stress associated disorders, as yet no reports on its adaptogenic potentials have appeared. Lack of information of its potential usefulness as an adaptogen triggered our interests to conduct a pilot study for the selection of safe and yet effective dose range that could be used for future evaluation of its beneficial effects against stress induced comorbid psychopathologies. For such purposes, a standardised and pharmacologically well validated mouse bioassay for herbal adaptogens [29,30] was used. Swiss albino male mice (20±5 g) were obtained from the Central Animal House of the Institute of Medical Sciences, Banaras Hindu University, Varanasi, Uttar Pradesh, India (Registration Number: 542/AB/CPCSEA). Prior approval from the Central Animal Ethical Committee of the University (CAECU) was taken for this study protocol (Dean/2014/ CAEC/609, dated 30.05.2014). The animals were housed in groups of six in polypropylene cages at an ambient temperature of 25±1°C and 45-55% relative humidity, with a 12:12 h light/dark cycle. They were always provided with commercial food pellets and water ad libitum, and were acclimatized for at least 1 week before using them for the experiments. Behavioural experiments were conducted between 09.00 and 14.00 h, and "Principles of laboratory animal care" (NIH publication number 85-23, revised in 1985) guidelines were always followed. Male mice were equally divided in experimental groups of six animals each. Ascorbic acid (Sigma Aldrich Chemicals Pvt. Ltd., Bangalore) was dissolved in distilled water for oral treatment of animals. Before administration, this acidic solution was neutralized with sodium bicarbonate to maintain pH 6.8-7.4. Orally administered volume of treatments was always 10 ml/kg, and the control animals were treated accordingly with the vehicle only. In this pilot experiment the effects of single and repeated daily oral doses of ascorbic acid (5, 25, 125 and 625 mg/kg/day; p.o.) were evaluated in mice groups on 1, 5, 7, 10, 11 and 12 day of the experiment. Diazepam (5 mg/kg/day) was used as a reference or standard drug. The standard drug treated group was always run in parallel in the experiment, and all tests were conducted 60 min after the treatments (except for the last day of the experiment when no treatments were given). Experimental protocol used in this pilot study is graphically summarized in Figure 1. On 1st, 5th, 7th and 10th day of experiment the body weight and rectal temperatures of all the animals were measured before drugs administration. After 60 min of treatment with the drugs to their respective groups, individual mouse from each group was placed in a black box (24 x 29 x 40 cm) with a grid floor for 1 min. Electric foot shock through the grid floor (2 mA, 50 Hz of 2 ms duration) was delivered for transient stress induction. Five consecutive foot shocks of 2 mA at 10 s intervals were given starting at 10 s. At the end of a minute the animals were placed back in their home cage. Change in rectal temperature was measured after 10 min by rectal thermometer . On the 11th day of the experiment body weights and rectal temperatures of all the animals were measured before and 60 min after the drugs administrations, immediately thereafter individual mouse from each group was hung on a wire in an upside down posture. After initial vigorous movements, the mouse assumed an immobile posture and the period of immobility during 5 min observation were recorded . On the 12th day (i.e. 24 hr after the last treatments) body weights and rectal temperatures of all the animals were recorded again. Immediately thereafter, individual mouse from each test group was challenged with pentobarbital (40 mg/kg, i.p.) for sleep induction. Time taken (in seconds) for onset of sleep (loss of righting reflex), and duration of sleep were recorded . Mean±standard error of mean (SEM) was calculated for the observed values in each experimental group. Statistical analysis was performed by one way analysis of variance (ANOVA) followed by Student-Newman-Keuls multiple comparison test. Two way ANOVA followed by Bonferroni post test, and t-test were performed when stated. GraphPad Prism- 5 software (GraphPad Software, Inc. CA, USA) was used for statistical analysis. Origin-Pro 8 (OriginLab Corporation, MA, USA) software was used for graph representation. p<0.05 was considered to be statistically significant. Mean body weights of the control, reference drug and different doses of ascorbic acid treated groups on the observational days are shown in the Figure 2. It is apparent from this figure that mean body weights of control group decreased significantly and continuously during the 12 observational days, and that such were also the cases for the diazepam (5 mg/kg/day) or 5 and 25 mg/kg/day ascorbic acid treated groups. On the contrary, mean body weights of the 125 and 625 mg/kg/day ascorbic acid treated groups on day 5 onward were always higher than those recorded for them on the 1st day of the experiment. Rates of increases in body weight of both these groups were almost equal and similar in magnitude to those expected for male mice of the colony used in this experiment. These observations reveal that minimally effective daily oral doses of ascorbic acid in affording protections against intermittent foot shock and daily handling triggered weight losses in mice lie between 125 mg/kg and 25 mg/kg, and that in this respect it is most probably not an diazepam like anxiolytic agent. 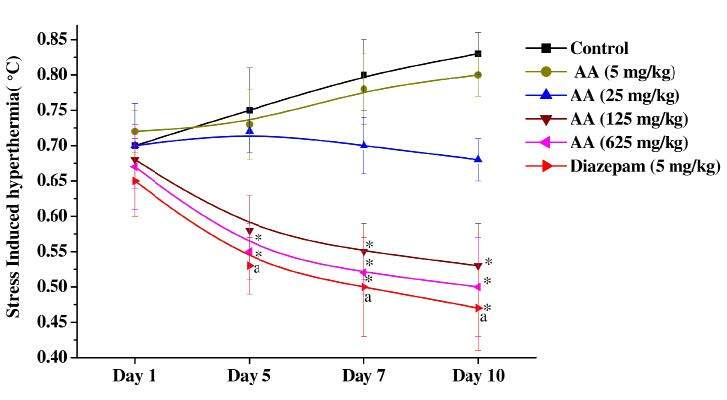 Figure 2: Effect of daily handling and intermittent foot shock stress on mean body weights of mice treated with Ascorbic acid, or with diazepam. Values are mean±SEM, n=6. *p<0.05 versus control group (Two way ANOVA followed by Bonferroni post tests). AA- Ascorbic acid. Mean basal rectal temperatures of different groups recorded during the course of the experiments were showed in the Figure 3. As expected from our earlier observations made under similar experimental conditions, basal rectal temperatures of the vehicle treated control group increased slightly on the 5th day and subsequent observational days and remained almost constantly elevated on the 7th, 10th, 11th, and 12th days of the experiments. This daily handling and intermittent foot shock-induced elevation of body temperatures within physiological ranges were antagonized by ascorbic acid dose higher than 25 mg/kg/day, and such was also the case for the reference drug diazepam (5 mg/kg/day) treated group. Unlike in the control groups, basal rectal temperature of the diazepam treated group remained almost constant on all observational days. Except for the 5 mg/kg/day ascorbic acid treated group, mean basal rectal temperatures of all other ascorbic acid treated groups were significantly lower than those of the control group on the 10th, 11th and 12th days of the experiment and were similar in magnitude to those of the control group recorded on day 1. These observations reveal that the minimally effective daily oral dose of ascorbic acid for antagonising handling and foot shocks triggered slight elevation of basal rectal temperatures is 25 mg/kg, and that in this respect its effects are qualitative similar to that of the anxiolytic diazepam. Figure 3: Effect of ascorbic acid, or of diazepam, on basal rectal temperature in mice on day 1, 5, 7, 10, 11 and 12 of the experiment. Values are mean±SEM, n=6. ¥p<0.05 versus day 1 values of the same group (One way ANOVA followed by Student-Newman-Keuls multiple comparison test) and *p<0.05 versus control group (Two way ANOVA followed by Bonferroni post tests). AA- Ascorbic acid. As shown in Figure 4, transient hyperthermic responses induced by 1 min duration of foot shocks in the vehicle treated control group on the 5th, 7th and 10th observational days were a higher than that observed for the group on the first day. But this mean value of the group was always between 0.7 and 0.9°C. On the first test day the mean values of all the other test groups were statistically not significantly different from the control group. However statistically significant antagonistic effects of diazepam (5 mg/kg/day) and 125 or 625 mg/kg/day doses of ascorbic acid against this response were observed on observational days 5, 7 and 10. Although efficacies of treatments observed in these three groups increased somewhat with increasing number of test days, none of them completely abolished the foot shock stress triggered transient hyperthermia. On all test days the mean values of the 5 mg/kg/day ascorbic acid treated groups were almost identical to those of the control group, whereas those of the 25 mg/kg/day ascorbic acid treated one on days 7 and 10 were somewhat lower (but not statistically significantly different) than those of the control group. These observations reveal again that the pharmacologically effective dose range of ascorbic acid against stress triggered responses increases with increasing number of days of daily treatments, and that its pharmacologically effective dose range against stress triggered responses lies between 25 and 125 mg/kg/day. Results of the tail suspension test conducted on the 11th day of the experiment are summarised in Table 1. Like in our earlier studies using the same bioassay system , significant effect of daily diazepam (5 mg/kg/day) treatment was observed in this test. Diazepam like and statistically significant and dose dependant effects of ascorbic acid was observed after its 11 daily doses between 25 and 625 mg/kg. Hereupon the efficacy of 125 mg/kg/day ascorbic acid was comparable to that of 5 mg/kg/day diazepam. 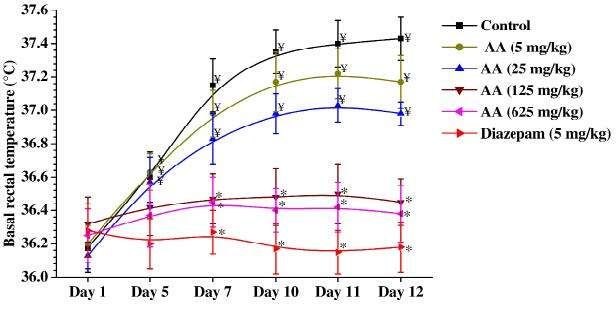 Figure 4: Effects of ascorbic acid and of diazepam on foot shock stress induced transient hyperthermia in mice on the observational days 1, 5, 7 and 10. Values are mean±SEM, n=6. ap<0.05 versus control group on same day with diazepam group (t-test) and *p<0.05 versus control group (Two way ANOVA followed by Bonferroni post tests). AA- Ascorbic acid. Values are mean±SEM, n=6. *p<0.05 versus control group (One way ANOVA followed by Student-Newman-Keuls multiple comparison test). AA- Ascorbic acid. Table 1: Effect of ascorbic acid on tail suspension test on day 11 of the experiment. As compared to the mean values for sleep induction and duration of sleep in the vehicle treated control group, those of the diazepam treated one were significantly lower (Table 2). Statistically significant and dose dependant effects of ascorbic were observed after its 11 daily oral doses between 25 and 625 mg/kg. Quantitatively, the efficacy of the highest dose of ascorbic tested (625 mg/kg/day) was of the same order of magnitude as that of 5 mg/kg/day diazepam. In pentobarbital induced sleep test, ascorbic acid and diazepam treated groups showed significant potentiating effects on onset and duration of sleep in dose dependent manner as compared to control mice. Since this test was conducted 24 hours of the last administered doses of the test agents, their observed effects seem to be due to their longer lasting physiological effects after their repeated daily oral doses. Table 2: Effect of ascorbic acid in pentobarbital induced sleep test conducted on day 12 of the experiment (i.e. 24 hours after 11 daily treatments). Ascorbic acid contents of several edible and other medicinal plants commonly used in Ayurvedic and other traditionally known systems of medicine as rejuvenating or adaptogenic herbs are high, and its antioxidative and stress response modulating effects in plants have been known since long . Although numerous reports have consistently revealed its diverse brain function modulating and stress response modulating activities [2-4,6-12,15-17,21,23,26], as yet no report comparing the efficacies of it pharmacologically interesting dose ranges after its single and repeated daily doses have appeared. Observations reported in this communication add experimental evidences in support of the conviction that ascorbic acid could be pharmacologically classified as an adaptogen with a broad spectrum of stress response modulating activities, and suggest that its efficacies will depend not only on its daily doses but also on the number of days of treatments. To our judgements this is the first report of a more systematic dose finding study with the acid commonly consumed with every day meals, or with numerous herbal remedies and nutraceuticals. The mouse bioassay used in this pilot study evolved during our efforts to define psychopharmacological activity profiles of Ayurvedic and other traditionally known herbal remedies, and is now often used in our laboratories for identifying bioactive constituents of herbal adaptogens . By definition adaptogens are nontoxic substances that non-specifically increase the resistance of an organism to wide range of harmful influences and normalize its functions , and their anxiolytics or antidepressants like and other efficacies observed in animal models are mainly due to their stress response modulating effects . Diverse modified versions of stress induced hyperthermia tests are now often used for identifying anxiolytic like effects of test agents [37,38], and it has been known since long that psychological stress elevates core body temperature [39,40]. Amongst all rodent models for conventionally known antidepressants, the mouse tail suspension test is the most versatile one in which the efficacies of agents with diverse modes of actions can be easily detected after their repeated daily doses . Our earlier observations have revealed that the stress response modulating effects of psychoactive drugs like diazepam or imipramine as well as those of the glucose homeostasis regulating drug metformin can be detected in the bioassay procedure used in this study. Although diazepam was initially developed as an anxiolytic drug, its antidepressants like efficacy have also been observed in clinical trials after its single or repeated daily doses . Since both anxiolytic and antidepressant like efficacy of repeated low oral doses (5 mg/kg/day) of diazepam could easily be detected in the mouse bioassay system in our earlier studies , the same dose of the drug was used as a reference in this study as well. Observations reported in this communication reveal that except for the body weight losses caused by daily handling and intermittent foot shock stress, the observed effects of ascorbic acid on all other quantified parameters were qualitatively almost identical to those of diazepam. It must be noted that neither the tested dose of diazepam nor even the highest dose of ascorbic acid tested (625 mg/kg) had any significant effects on foot shock stress triggered transient hyperthermia after their first oral doses and that all observed efficacies of both the test agents increased with the increasing number of treatment and observational days. Therefore, it is seems reasonable to assume that although both the test agents are modulators of diverse stress-triggered responses quantified in this bioassay, their modes and sites are most probably not identical. Reduction in body weights and elevation of core temperatures are observed in rodents subjected to experimental stress and both these responses can be modulated by altering the palatability or caloric values of their meals [43,44]. Both these stress triggered alterations observed in the vehicle treated control group during the course of the experiment were completely absent in the 125 mg/kg/day as well as 625 mg/kg/day ascorbic acid treated groups. These observations taken together other bioactivities of ascorbic acid observed in this study suggest that 125 mg/kg is the maximally effective stress response inhibiting daily dose of ascorbic acid for affording complete protection against both the long term effects of daily handling and intermittent foot shock stress triggered physiological responses in mice, and that its 5 times higher oral daily doses are well tolerated by them. It was interesting to note though, that 125 mg/kg/day was not the maximally effective dose of ascorbic acid in the tail suspension test or in the pentobarbital induced sleep test. In both these tests, efficacy of 625 mg/kg/day of ascorbic acid were somewhat higher than those of its 125 mg/kg daily doses. These observations could indicate that its modulatory effects on central sensitivity of the animals to tail suspension stress or to sedative effects of pentobarbital are not due to its observed effects on body weight losses and thermoregulatory mechanisms only. More detailed and precise dose response experiments and by quantification other stress responses will be necessary for more definitive statements concerning the pharmacologically interesting dose ranges of ascorbic acid and its modes and sites of action. It remains certain though, that although some observed effects of ascorbic acid are like those of diazepam, its observed activity profile in the bioassay is more like those of centrally acting adaptogens than those of the conventionally known anxiolytic. It must be noted though that the pentobarbital hypnosis test used in this bioassay is a sensitive one not only for detecting effects of agents on central nervous system, but also for estimating the effects of treatments on drug metabolising enzymes. Thus the efficacy of ascorbic acid or diazepam observed in this test must not necessarily be due to its central sensitivity altering properties only. Since this daily dose dependant efficacy of ascorbic acid in this test was observed 24 hours after its last oral doses, this could as well be due its long term regulatory effects on genetic expressions [45,46]. That such could as well be case is suggested also by the observations that its minimally effective daily dose for all its quantified effects in the bioassay was always 25 mg/kg/day, and that all its stress response protective effects quantified always increased with increasing number of treatment days. Therefore efforts to experimentally verify this possibility will now be made in our laboratories. During such effort due attention will be paid to the bactericidal and bacteriostatic activities of ascorbic acid, which could alter the gut microbial ecology involved in regulating stress responses . Amongst all bioactive constituents of herbal remedies and plant derived diets commonly recommended by Ayurvedic medical practitioners for prevention and cure of stress triggered psychopathologies, ascorbic acid is one of the quantitatively major one. Although reports on beneficial effects of different oral doses of ascorbic acid supplementation in improvingmood disorders continue to appear [48,49], as yet little concentrated efforts have been made to more precisely define the role of ascorbic acid in synergistic effects of diverse bioactive food phytochemical involved in such clinically observed mental health benefits of the vitamin. Observations made to date with structurally and functionally diverse food phytochemicals and using the described mouse bioassay, encourage us suggest that it could be used not only for dose finding studies of adaptogens, but also for better understanding of the complex biological interactions between ascorbic acid and other food phytochemicals involved in regulation of mental and physical health. Results contribute to better understand the role played by ascorbic acid in regulating neuronal functions, and demonstrate that its pharmacological doses could as well be a better therapeutic alternative for treatments of comorbid psychopathologies. They reveal that, repeated daily doses of ascorbic acid are necessary for observing its adaptogen like mental function modulating activities. Further efforts to identify its appropriate combinations with known drugs and bioactive phytochemical, and efforts to define their modes of actions, could as well lead to novel pharmacological targets for treatments of psychopathologies commonly associated with environmental stress. Padh H (1990) Cellular functions of ascorbic acid. Biochem Cell Biol 68: 1166-73. Rebec GV, Pierce RC (1994) A vitamin as neuromodulator: ascorbate release into the extracellular fluid of the brain regulates dopaminergic and glutamatergic transmission. Prog Neurobiol 43: 537-65. Rice ME (2000) Ascorbate regulation and its neuroprotective role in the brain. Trends Neurosci 3: 209-16. Rosa KA, Gadotti VM, Rosa AO, Rodrigues ALS, Calixto JB, et al. (2005) Evidence for the involvement of glutamatergic system in the antinociceptive effect of ascorbic acid. Neurosci Lett 381: 185-8. Mikirova N, Casciari J, Rogers A, Taylor P (2012) Effect of high-dose intravenous vitamin C on inflammation in cancer patients. J Transl Med 10: 189. Puty B, Maximino C, Brasil A, da Silva WL, Gouveia A Jr, et al. (2014) Ascorbic acid protects against anxiogenic-like effect induced by methylmercury in zebrafish: action on the serotonergic system. Zebrafish 11: 365-70. Mazloom Z, Ekramzadeh M, Hejazi N (2013) Efficacy of supplementary vitamins C and E on anxiety, depression and stress in type 2 diabetic patients: a randomized, single-blind, placebo-controlled trial. Pak J Biol Sci 16: 1597-6000. Moretti M, Budni J, Freitas AE, Rosa PB, Rodrigues ALS (2014) Antidepressant-like effect of ascorbic acid is associated with the modulation of mammalian target of rapamycin pathway. J Psychiatric Res 48: 16-24. Moretti M, Colla A, de Oliveira Balen G, dos Santos DB, Budni J, et al. (2012) Ascorbic acid treatment, similarly to fluoxetine, reverses depressive-like behavior and brain oxidative damage induced by chronic unpredictable stress. J Psychiatr Res 46: 331-40. Moretti M, Freitas AE, Budni J, Fernandes SC, Balen GD, et al. (2011) Involvement of nitric oxide-cGMP pathway in the antidepressant-like effect of ascorbic acid in the tail suspension test. Behav Brain Res 225: 328-33. Binfare RW, Rosa AO, Lobato KR, Santos ARS, Rodrigues ALS (2009) Ascorbic acid administration produces an antidepressant-like effect: Evidence for the involvement of monoaminergic neurotransmission. Prog Neuropsychopharmacol Biol Psychiatry 33: 530-40. Cocchi P, Silenzi M, Calabri G, Salvi G (1980) Antidepressant effect of vitamin C. Pediatrics 65: 862-3. Chen Q, Espey MG, Sun A, Pooput C, Kirk KL, et al. (2008) Pharmacologic doses of ascorbate act as a prooxidant and decrease growth of aggressive tumor xenografts in mice. Proc Natl Acad Sci USA 105: 11105-9. Casciari JJ, Riordan HD, Mirranda-Massara JR, Gonzalez MJ (2005) Effects of high dose ascorbate administration on L-10 tumor growth in guinea pigs. P R Health Sci J 24: 145-50. Moretti M, Budni J, Dos Santos DB, Antunes A, Daufenbach JF, et al. (2013) Protective effects of ascorbic acid on behavior and oxidative status of restraint - stressed mice. J Mol Neurosci 49: 68-79. Deshpande C, Dhir A, Kulkarni SK (2006) Antagonistic activity of ascorbic acid (vitamin c) on dopaminergic modulation: apomorphine-induced stereotypic behavior in mice. Pharmacology 77: 38-45. Naseer MI, Lee HY, Kim MO (2010) Neuroprotective effect of vitamin C against the ethanol and nicotine modulation of GABAB receptor and PKA-α expression in prenatal rat brain. Synapse 64: 467-77. Kimelberg HK, Goderie SK (1993) Effect of ascorbate on Na(+)-independent and Na(+)-dependent uptake of [3H] norepinephrine by rat primary astrocyte cultures from neonatal rat cerebral cortex. Brain Res 602: 41-4. Paterson IA, Hertz L (1989) Sodium-independent transport of noradrenaline in mouse and rat astrocytes in primary culture. J Neurosci Res 23: 71-7. Girbe F, Ramassamy C, Piton C, Costentin J (1994) Ascorbic acid increases synaptosomal potassium-induced dopamine release. Neuroreport 5: 1027-9. Gulley JM, Rebec GV (1999) Modulatory effects of ascorbate, alone or with haloperidol, on a lever-release conditioned avoidance response task. Pharmacol Biochem Behav 63: 125-9. Nurse B, Russell VA, Taljaard JJ (1985) Effect of chronic desipramine treatment on adrenoreceptor modulation of [3H] dopamine release from rat nucleus accumbens slices. Brain Res 334: 235-42. Pierce RC, Rowlett JK, Rebec GV, Bardo MT (1995) Ascorbate potentiates amphetamine-induced conditioned place preference and forebrain dopamine release in rats. Brain Res 688: 21-6. Seitz G, Gebhardt S, Beck JF, Bohm W, Lode HN, et al. (1998) Ascorbic acid stimulates DOPA synthesis and tyrosine hydroxylase gene expression in the human neuroblastoma cell line SK-N-SH. Neurosci Lett 244: 33-6. Sershen H, Debler EA, Lajtha A (1987) Effect of ascorbic acid on the synaptosomal uptake of [3H]MPP, [3H]dopamine, and [14C]GABA. J Neurosci Res 17: 298-301. Brody S, Preut R, Schommer K, Schurmeyer TH (2002) A randomized controlled trial of high dose ascorbic acid for reduction of blood pressure, cortisol, and subjective responses to psychological stress. Psychopharmacology 159: 319-24. Brekhman, II, Dardymov IV (1969) New substances of plant origin which increase non specific resistance. Annu Rev Pharmacol 9: 419-30. Gupta V, Lahiri SS, Sultana S, Kumar R (2009) Mechanism of action of Rhodiola imbricata Edgew during exposure to cold, hypoxia and restraint (C-H-R) stress induced hypothermia and post stress recovery in rats. Food Chem Toxicol 47: 1239-45. Thakur AK, Chatterjee SS, Kumar V (2014) Neuropsychopharmacology of a therapeutically used Andrographis paniculata extract: a preclinical study. Orient Pharm Exp Med 14: 181-91. Langstieh AJ, Verma P, Thakur AK, Chatterjee SS, Kumar V (2014) Desensitization of mild stress triggered responses in mice by a Brassica juncea leaf extract and some ubiquitous secondary plant metabolites. Pharmacologia 5: 326-38. Zethof TJJ, Van der Heyden JAM, Tolboom JTBM, Olivier B (1994) Stress-induced hyperthermia in mice: a methodological study. Physiol Behav 55: 109-15. Bai F, Li X, Clay M, Lindstrom T, Skolnick P (2001) Intra- and interstrain differences in models of "behavioral despair". Pharmacol Biochem Behav 70: 187-92. Ojima K, Matsumoto K, Tohga M, Watanabe H (1995) Hyperactivity of central noradrenergic and CRF system is involved in social isolation-induced decrease in pentobarbital sleep. Brain Res 684: 87-94. Smirnoff N (2000) Ascorbic acid: metabolism and functions of a multi-facetted molecule. Curr Opin Plant Biol 3: 229-35. Panossian A, Wikman G (2009) Evidence-based efficacy of adaptogens in fatigue, and molecular mechanisms related to their stress-protective activity. Curr Clin Pharmacol 4: 198-219. Provino R (2010) The role of adaptogens in stress management. Aust J Med Herb 22: 41-9. Van Der Heyden JAM, Zethof TJJ, Olivier B (1997) Stress-induced hyperthermia in singly housed mice. Physiol Behav 62: 463-70. Olivier B, Zethof T, Pattij T, Van Boogaert M, Van Oorschot R, et al. (2003) Stress-induced hyperthermia and anxiety: pharmacological validation. Eur J Pharmacol 463: 117-32. Reeves DL, Levinson DM, Justesen DR, Lubin B (1985) Endogenous hyperthermia in normal human subjects: experimental study of emotional states (II). Int J Psychosom 32: 18-23. Marazziti D, Di Muro A, Castrogiovanni P (1992) Psychological stress and body temperature changes in humans. Physiol Behav 52: 393-5. Bourin M, Chenu F, Ripoll N, David DJ (2005) A proposal of decision tree to screen putative antidepressants using forced swim and tail suspension tests. Behav Brain Res 164: 266-9. Tiller JW, Schweitzer I, Maguire KP, Davis B (1989) Is diazepam an antidepressant? Br J Psychiatry 155: 483-9. Bazhan N, Zelena D (2013) Food-intake regulation during stress by the hypothalamo-pituitary-adrenal axis. Brain Res Bull 95: 46-53. Balcombe JP, Barnard ND, Sandusky C (2004) Laboratory routines cause animal stress. J Am Assoc Lab Anim Sci 43: 42-51. Arrigoni O, De Tullio MC (2002) Ascorbic acid: much more than just an antioxidant. Biochim Biophys Acta 1569: 1-9. Rodriguez-Melendez R (2002) Importance of water-soluble vitamins as regulatory factors of genetic expression. Rev Invest Clin 54: 77-83. Klaus HD (2014) Frontiers in the bioarchaeology of stress and disease: cross-disciplinary perspectives from pathophysiology, human biology, and epidemiology. Am J Phys Anthropol 55: 294-308. Zhang M, Robitaille L, Eintracht S, Hoffer LJ (2011) Vitamin C provision improves mood in acutely hospitalized patients. Nutrition 27: 530-3. Wang Y, Liu XJ, Robitaille L, Eintracht S, MacNamara E, et al. (2013) Effects of vitamin C and vitamin D administration on mood and distress in acutely hospitalized patients. Am J Clin Nutr 98: 705-11.